Here we are again at Irashai Grill. 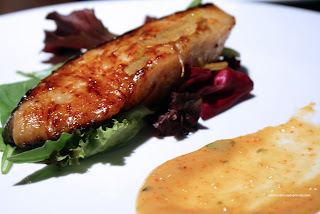 I was lucky enough to be invited to a tasting with a few other food bloggers back in May. I initially tried to talk Kim into attending as well; but he had already tried Irashai before and stuck by his original assessment. Hey, I totally respect that. Today, with Kim, Victoria and Anita, we were doing a photography workshop with Jackie Connelly. There was an option to eat at Irashai afterwards at our own expense. I guess this was a good idea since I could re-evaluate Irashai under different conditions. Although they did know who we were and thus, not really replicate a surprise visit. 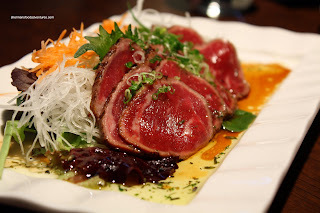 We started off with the Beef Tataki Carpaccio which was beautifully presented on a bed of greens, daikon and carrot. Interestingly, despite looking buttery soft, the beef was a bit chewy. The citrus ponzu and herbed oil sauce was mostly... oil. Not sure if that was the intention. 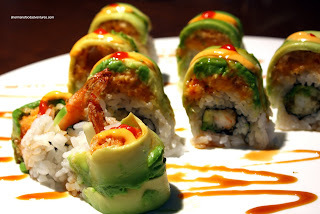 The next item was the Summer Roll consisting of a shrimp tempura, avocado, cucumber, masago, tuna and mayo. I've had this roll before and it was quite pleasant, I especially liked the siracha kick at the end. However, there was no crunch from the tempura which ultimately did not provide the texture contrast needed in this roll. 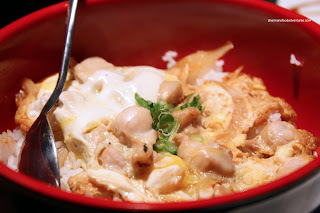 Interestingly, Kim ordered the Oyako Don. His reasoning was to try a straight-up Japanese dish without the distraction of fancy fusion implements. Well... this was disappointing. If you look in the picture, you can definitely see egg, onion and chicken; but the dish was devoid of any flavour. The rice was completely white underneath without the usual penetration of dashi, mirin and soy. On a positive note, the rice was a nice consistency being a bit chewy. On the topic of chewy, the Aigamo was extremely tough. 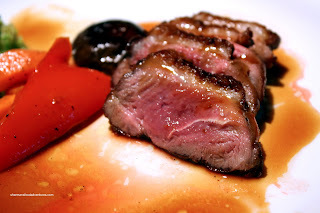 It was cooked exactly how we wanted, being a bit rare; however, it was like gnawing on an overcooked piece of chuck steak. This usually shouldn't be the case. We were all quite confused why this might be. In the end, we didn't come up with a definitive explanation. Maybe it might have helped to slice the breast thinner? I wonder if, due to what happened, we should do more re-visits... But, thanks for agreeing to stay for lunch! Yah, I agree with the revisits. I've done a few and things are definitely different. However, more often than not, most places are the same. It's those places which are too good or too bad in either direction that need more samples. No probs, I enjoy the company! Yeah, consistency is definitely key. Sherman, it was great meeting you last week! Nice meeting you too Victoria! Yes, wasn't as good as the first time. Curiously, they knew we were there and it still turned out the way it did. But it further proves the point that even if they see you coming, the food will be what it is regardless. It's akin to anything that requires skill. Just because they know it's important doesn't mean anyone can morph into something remarkably better or worse. It is what it is.